We finally know when the Destiny 2 PC beta will kick off, and we also know just how much PC you'll need to run it. In its weekly update on Friday, Bungie revealed not only when you'll be able to jump into the Destiny 2 beta on PC, but also just how much machine you'll need to run it. The PS4 and Xbox One beta has already ended, but the PC beta is about a month away. The beta begins on August 28 for those who pre-ordered, with the open beta kicking off on August 29. The beta will end for everyone on August 31. Start times will be announced later, but for now, at least we know the days for the beta. You can find all this info and more in Bungie's Weekly Update. Destiny 2 is coming to PS4, and Xbox One on September 6, with the PC release following about six weeks later on October 24. Relatively modest requirements. Here's hoping it runs well. Did the console beta already happen? Can anyone who played it offer their take on the game? Console was a couple weeks ago. Uh, if you liked the first one, you'll probably like this one? Compared to the demo that was Destiny 1's beta (literally, if you downloaded the demo post-release, it was the same level cap and amount of areas and everything), this was much more a beta/server test. There was 1 mission (across two levels), a singular strike, and 1 map for 2 PvP modes. Then a social/hub space with all the NPCs removed in the last day or two. Are they bringing anything new to the table with this, or will it be the same grind Destiny was? Well since I'm on PC I have no experience with the first game so that doesn't really apply to me. I was more just interested in how it felt to play and general impressions. I find it pretty fun to play. Bungie has a solid handle on their FPS basics. There's some more mobility and the special powers of course. I can't really comment on the PvP too much, some people love it, some people hate it, and some people hate simply the power aspects of it. The two main perils are that its a grind--up game. Obviously off a two mission beta there's no sense of overall progression and how they've refined it for the sequel. Destiny had a certain sparseness of end-game content, before at the end of the vanilla cycle having a decent amount, which they then left behind with Taken King, but then brought back at the end of the content line for that game. 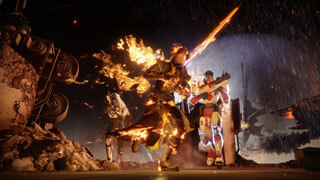 There were issues mentioned both with having to develop cross-gen (which they ditched for the final expansion), and whatever they were using to make the game itself hindering content release, but I don't know if they've mentioned how readily they can supply content for D2. The other caveat is that its a co-op game. From the Beta, it doesn't seem like they've added ingame chat or LFG mechanics, with mostly some upgrades to interacting with your clan. So if you don't bring 2(most missions)-3(the beta pvp modes) (or presumably 5 again, for Raids) buddies in to the table, you'll be stuck with matchmaking randoms, which has its issues. Also Raids never did get matchmaking even as an optional in D1. Enemy variety was another sticking point. Spawns do seem a bit more randomized now, from the small view you could get of this in the beta strike mission. 3 of the 4 enemy races from the original were seen. Cabal seem to have gotten a decent expansion, having multiple variants of their old 5 types, and two entirely new ones. Fallen and Vex just had the variants, but that could be a content hold back on the beta or simply the mission itself. It seemed like my Titan was moving through molasses compared to my D1 Titan, but it turns out that the beta Titan's armor started out all Armor spec, with no agility. Considering that's not remotely how I speced my old Titan, that accounted for the slow feel. Also, class abilities are pretty great. It helps solidify the difference between, say, an Arcblade Hunter and a fast spec Striker Titan.